I have an interview with the ever-enthusiastic Livia Peterson today! Short, simple, and unique – just the way I like it. If you missed the #SFFWRTCHT Twitter chat last week, the full transcript is now up at the SFFW Chat Website. And on Tuesday, Cassafire is the featured science fiction book with The Fussy Librarian! And now, please welcome one of the funniest, sweetest, and most positive authors I know - Elizabeth Seckman! My grandmother was a writer; a dreamer; an agoraphobic cat lover. She owned several acres of “farm” land that bumped up against a busy city. It was a green oasis just a few turns from the interstate. There was never any live stock on the farm, just pets. Lots and lots of pets. Seems people knew Mary Hartman had a soft heart and kept any creature dumped on her. Many times all of her monthly income would be spent at the vet as she scrambled to keep all the animals healthy and spayed. I was in my teens when it hit me- my grandma was a crazy cat lady! At least I knew that was how the world saw her. People didn’t care that she was once a speakeasy songstress or a greeting card poet. Nope. Most of the world didn’t see past the cats. People would be rude to her…make sneaky snide comments. Wow. That would that light me up. I’d want her to get mad, to get even…but she never did. That’s some highly beneficial advice for a writer. The literary world is a striated mish mash. From the smalls to the bigs. The traditionals and the indies. We meander in many of the same circles vying for the same market. So, as I wander, I take note- who is snarky, who is helpful, who is kind to the newbie who can’t even spell query? Who won’t deign to mingle with the uncontracted? Offer help when it doesn’t further their own career? These are important things to know because everyone starts at the beginning. And unless you have a crystal ball, no one knows who will be where in a year…or five…or ten. That’s a mystery, but who you can trust doesn’t have to be. While you’re sitting on the lower rungs? This is where you find out where the loyal, dependable, trustworthy, and true are. Take notes and remember. Elizabeth Seckman is a simple chick with a simple dream…to write stories people want to read. Find her - Blog, Facebook, and Amazon. Fate Intended is the third book in the Coulter Men Series. Fate brought them together…reality may tear them apart. And to celebrate the release of Fate Intended, Elizabeth’s publisher is offering the first two books for ninety-nine cents on Amazon - Healing Summer and Past Due! The ever-amazing Father Dragon threw an anniversary party this weekend that is probably still in full swing. Honoring his best friends with kind words and this award, Al revealed his dedicated heart and wise soul. Thank you, my friend. Karen’s Very Prestigious Blog Awards are now open for voting. Several blogger buddies are nominated and I’m up for favorite blog! 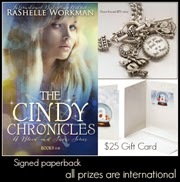 All six volumes of The Cindy Chronicles by RaShelle Workman are now available in one set for one great price! And she’s offering prizes to celebrate, so check it out! Frozen comes out November 27, and despite my initial reservations, I may have to go see this one. It’s currently 91% on Rotten Tomatoes and being hailed a classic. This Thursday is Thanksgiving for those of us in the USA. Wishing all of you a happy Thanksgiving. Enjoy your day of food, family, and potentially crappy football. Milo James Fowler is hosting another Freebies special – Tis More Blessed. “If you have a book/eBook/short story/collection you'd like to give away or raffle off on Friday December 6th, Friday the 13th, Friday the 20th, or Friday the 27th, just enter your name and the date(s) of your giveaway under Link Title.” I’ve signed up to give away copies of my books, but I’m a rebel – I will be giving them away on Monday, December 16. The last Insecure Writer’s Support Group posting of the year is on December 4. Please note that the first one of 2014 will be the second Wednesday, January 8, due to the New Year’s Day holiday. Lexa Cain and Julie Flanders’ Dream Destination Blog Hop is December 5-8. Lots of prizes for this one! We also have a second badge now, designed by the awesome Jeremy Hawkins. The signup list opens December 1 – join us in posting some encouraging words of prayer or blessing on Christmas Eve. Jo Blo listed some awesome images they’d found around the net, including this one from Brian Rood, titled Indiana Jones. Check out his site for more amazing images. Do you know a crazy cat lady? Participating in any of those events? Think the images are awesome? And what are you doing for Thanksgiving? 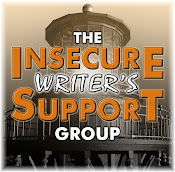 Be sure to visit Livia Peterson for my interview, the Insecure Writer’s Support Group for revision tips, and if you missed my Twitter chat last week, the SFFW Chat Website for the transcript. Your grandmother was a wise lady! And she shared some smart advice about character that applies to many different areas of life. Going to Luvia's site next. Definitely checking out the bloggers now that NaNo is past me. Elizabeth's post is amazing. Love her grandmother's advice. So true. Bookmarking this post. I needed to read something postive today after I received the message that I have to work either on Sunday 8th of December or Sunday 15th of December. I decided to read your post - A really good choice! I hope many people will enjoy the mesmerising Fantastic Flying Books video. I like the Indiana Jones image a lot. I'll definitely watch that video when there's more time...sounds like a good one just from the title. Have a good time at Livia's today! I've gotten more interested in Frozen the more I've seen of it, so count me in as excited for it, too. Happy Thanksgiving! And glad you're making progress on your outline. Wow, what a lot of info. My poor head can't retain that much!! Loved Elizabeth's guest post - her grandmother sounds like an awesome lady! Alex- There's a lot going on this week! Hi Elizabeth (virtual wave). I'm a crazy dog lady. :) Congrats on your new release. Edi, bummer! Take December 8 and get it over with. Thanks again for posting that video. Tony, yeah, it just didn't look appealing, but now I want to see it. Annalisa, don't let it explode! Since it's my year to work TG (and my dh's birthday is tomorrow) I'll be cooking turkey dinner tomorrow, working Wed. night, and sleeping on the actual holiday. Love that Indiana Jones image. So neat. For Thanksgiving I am going to my sister's house and we're all going to have Thanksgiving dinner there! Have a great Thanksgiving Alex! We call a neighbor the cat lady. She feeds every stray in the neighborhood. Congrats on the outline to your new book! Wishing you and your wife a very Happy Thanksgiving! Lot of stuff today! I'll have to check out the transcript of the chat. That's good advice about watching to see how other people treat those who can't help them. And yes, I wouldn't mind seeing Frozen--but my son doesn't like going to movies. (At least right now.) That's probably good for me! There was a crazy cat lady who lived at the end of road nearby when we were kids. Of course, I don't know that she was really crazy but she had a lot of cats! I feel like a crazy cat lady some days, but I don't think I've progressed that far yet. That's some pretty good advice. Grandmothers have a way of influencing us, and Elizabeth's grandmother was wise. It is only pleasant to be courteous with people no matter where you are in life, and it costs nothing. I sometimes see professional footballers who don't seem to have the words 'Good Morning' in their vocabulary - very sad. Love the Indiana Jones art work. 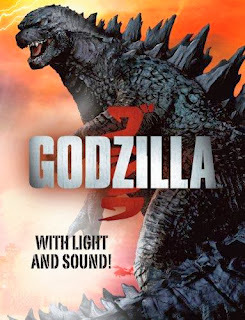 My son keeps asking me is it time to see Godzilla yet? I remember going to the movies with my dad to see it in 1985...good times. I'll definitely have to check out your revision tips on the IWSG website. I won't be working on my NaNo book for a while but I need to get going with revising my still nameless other book. Lots going on! And well done on that outline. Melissa, sleeping on Thursday sounds like a good idea. And that's disgusting about the house of cats. Sandra, take advantage - one day he will change his mind. David, I grew up with the Japanese originals. Sarah, we go without kids. I guess we are the kids then. I am totally in love with Elizabeth's grandma! What a wise and wonderful woman!! Awwwww! 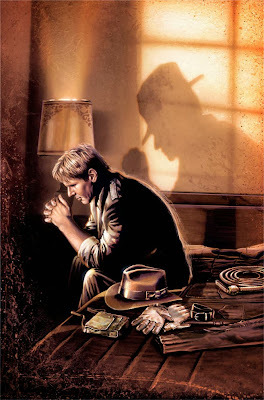 Oh that Indiana Jones pic is super awesome - there's something very sad about this Indiana Jones! What to go and hug him right now! That's amazing news! I thought Cassa was going to be your only trilogy- so glad to see we'll be getting to read more from you! Thank you Alex for stopping by my place today. It was an honor to host your CassaStorm blog tour. I plan on seeing Frozen - in 3D on opening day. I know it will be the BEST animated film I've seen this year besides Despicable Me 2. I'm unsure what the cost is of being nice that more people just don't approach life that way. Good that we have some crazy old cat ladies. The animals need it. Elizabeth, you grandmother sounds like a wonderful and caring person. What great advice she gave you. I am delighted you are writing Alex, the Cassa series was great so will look forward to whatever you come up with next. I will have to come back for the video segment. 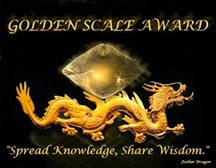 Congratulations on your Golden Scale Award. Wow, Alex, you're burning up the Net with all of your appearances! Go, you! And there are so many great blogfests and giveaways in DEC. I'm in the James Fowler one, yay! Duuh, I forgot to wish you and your wife a Happy Thanksgiving. I used to enjoy this holiday in NC, but our holiday is, of course, in October and we dont' make so much of it here in Canada. Awesome Indy pic indeed. Also heard Frozen was as good as the Disney movies of old. Great advice too, some times people just like to prop themselves up by making fun of others, tons of cats, whoopie. You are one busy blogger, Alex. That's some wonderful wisdom from Elizabeth's cat lady grandma. And hope you have a wonderful holiday, Alex. Alex, thanks for all the info you always provide us with! If it wasn't for you, I'd never know what was going on in the Blog-verse! I seriously don't know how you do it. Best of luck with the new outline! It sounds like an fun twitter chat Alex! Great advice on trust Elizabeth. I love the quote “If you ever want to know a person’s true nature, watch how they treat someone they have nothing to gain from.” So true. When I still had my pet supply store, everyone in the movie business ignored me. Now that I got several books and screenplays turned into film, everyone in the business wants to be my best friend. Kitty, he would appreciate a hug. Jo, hope I don't disappoint. And you should throw a US Thanksgiving party anyway. Jen, I do my best to keep up. You really are everywhere!!! Gosh, how do you do it all? I'm thrilled for Terry! Can't wait for her latest book's release. I spotlighted her a few years ago, as her first was breaking open into the publishing wild. She is such a genuine person. Elizabeth, your grandmother was a smart lady. I so agree with her too. thank you for the cheersfest 2.0... i think art is the only thing keeping me sane at the moment. Elizabeth, I really liked your post. It's something all of us have encountered. And very true. Excellent advice, Elizabeth. You're granny was a wise lady. Certainly this writerly community has given me lots of help, answering all sorts of questions and being supportive. Love the trailer for Ice Dogs and definitely intend to read it! And I'm signed up for three of the four blog hops! Lots of ground covered here, as usual, Alex. Interesting post from Elizabeth. So true that character shines through how we treat people who can't help us. Gonna have a look at Elizabeth's specials. Want to participate in a couple of the 'fests'. Great advice Elizabeth. I always find it odd that people draw those types of distinctions. Especially because, as writers, we all have so much to learn from each other, no matter where we are on the striation or how successful. Nice to hear from Elizabeth. Wish her well with her books! Thanks for all the news. Will check out your guest spots. Fabulous story about Elizabeth's grandmother! What an interesting woman who gave wonderful advice! I look forward to reading your tips at the IWSG, and to seeing you over at Livia's. Hope you and your wife have a great Thanksgiving Alex! I'm going to be hitting the road to go visit family for Thanksgiving. I just want to wish you a happy turkey day (or Turduckin if that's what you eat). It does sound like you are staying busy with all the appearances. I'm also excited to see Frozen, but I usually go to all the animated shows (for example I saw Turbo in theaters and most people I know just avoided that one). Elizabeth, I think crazy cat ladies are awesome. I aspire to be one. And what sage advice too! Happy Thanksgiving to you and your family, Alex! Congrats on the SFFW chat and on being featured by the Fussy Librarian! Elizabeth's right about people. I've seen quite a few who're contracted with the bigs who never return comments or help those still struggling. It makes me sad. Sometimes I wish I had a farm and could be a crazy cat lady - I love cats and the peaceful existence of the countryside. Great post, Elizabeth!! I had an awesome time at Father Dragon's shindig and didn't even mind when all my gummy bears disappeared. Whoa. I had to go over your post twice to make sure I didn't miss anything. All these blogfests and so little time! I had to watch that entire "Flying Book" movie with my daughter. It was incredible!!! Elizabeth, your grandmother was a wise woman. I shall take notes and remember indeed. Al's dragon party was a blast! So glad to hear you are in the swing of things with your new writing project. Glad Jan's IWSG will be second Wednesday. Right off to check out interviews! Ooh, writing tips. Off to check them out. Sheri, she is super nice! Jeremy, we'll help you keep it together. Michael, I've never tried Turduckin - looks like it would be a lot of effort to make. Have a safe trip! Jay, wasn't it amazing and with such a sweet spirit? Al, I'll gnaw on a turkey leg in your honor. Elizabeth, this was an awesome guest post! The Fantastic Flying Books is a fantastic animation! I saw it for the first time in April, on one of the AtoZ challenge blogs. It was awarded the Best Animated Short Film at the 84th Academy Awards. Great interview over at Livia's place! Yeah, I don't know what to comment on. It's all fantastically inspiring. I will say that I love Livia and Elizabeth. This was a very full post. So much going on. I suppose everyone gets extra done before the end of the year. Wise words, Elizabeth, and so true. I know I would have loved your grandmother. Thanks for sharing about our hop again, Alex. Happy Thanksgiving to you! AHAHAHAHA!! Too much information!!! Well, no. :) Never too much. Happy Thanksgiving to you and yours, Alex. I tried to watch the video but couldn't. You see, yesterday I participated in a true English tea party with 14 screaming nine-year old girls. It is silence I crave. I like what Elizabeth said about how you treat people. I used to worry that I'd end up being a crazy cat lady. I saw Thor 2 over the weekend and thought it was good. That Loki! Elizabeth's grandmother sounded like a very kind soul. She gave some good words to think about, too! I'm glad that outline is shaping up for you. Everytime I start thinking of a new project I swear it will be outlined the right way. Then, I end up getting so excited I start writing before I've got it all worked out. Almost always means I've got years of revisions ahead of me. And why is he design of Godzilla always such a secret? I recall the 90's reboot made it a huge secret, then when I finally saw it in the theater, I was like, oh, it's a giant lizard. Kind of what I expected. Well, not exactly what I expected, but still. Quite a post, Alex! Outlining a new book and all! Wow! Elizabeth's post has marvelous advice. My daughter has turned into a cat lady, so I relate to that and caring about those unable to care for themselves. Good luck to Elizabeth. Thank you for sharing so much. Very wise words, Elizabeth. I would have enjoyed knowing your grandmother. Elizabeth Seckman's book sounds wonderful, and I love her tagline. Also, Congrats to Terry Lynn Johnson her trailer is fabulous! Love the pic of Indy. He's one of my favorite characters. So glad to hear that about your writing. Don't you love it when a plan comes together? Grandmothers are such beautiful people! Love that post! Thanks for going all out with all the reminders of what's coming up - I've not been keeping track so it's wonderful to find it all in one place! Thank you for that! I really liked Elizabeth's post. The girl wrote the truth. Happy Thanksgiving to you and your family, too. Whoa! There is a lot packed in here today. Elizabeth - loved your 'crazy cat lady grandma'. I could be a crazy cat lady, except for the fact that I don't have any cats or even like them much for that matter. But all the rest - like the crazy part - oh yeah! So many blog hops just when I'm trying to take the cure. I may have to fall off the wagon to roast Lee, and that Christmas Eve prayer one sounds great. That picture is certainly 'Indy' at his best. I agree with Elizabeth there are writers in the Indie world who help a lot and others don't lift a finger. Too bad, huh? Love the Indiana Jones portrait. It's lovely. Have a great holiday Alex. SK, use at your own risk! Rusty, it was a giant iguana. Not what I expected. Wendy, or when a cliche saying comes together! Wow! Lots going on. Fantastic guest post by Elizabeth. Her grandmother was a wise woman. I'm popping over to Livia's! Thanks for having me over Alex! It really is an honor. You are too kind! I was busy today getting all the food plans ready for a our traveling football team and I thought, I really need to get to Alex's or I'm going to be knee deep in comment answering...and seems I am! Another wonderful problem to have!! @Elizabeth (what a lovely name ;) My grandma was wise. I learned a lot from that woman. @Annalisa, she was. Funny and sweet...God didn't make a soul much better than her! @Brinda, waves back!! I'm a crazy multi-pet lady! I've got a few too many of everything from dogs to frog. @Melissa, LOL. I understand the pre-coffee brain. Yeah, she did have plenty of room for all the animals. She'd be the first one to get mad that people over-crowded animals...better they be put down than suffer in filth. @Gossip, tha would be my grandma. My sister has taken up her mantle...she feeds all the strays in her neighborhood. @Sandra, yep. People are always nice to the people who can give them something...no test in that! @mshatch, no you never know what's in a person's mind (or heart) until you know them. @Fanny, grandmas are such a blessing. And I agree, some people really need to get over themselves! @Beer, no wonder your blog is so much fun! You got all that wisdom from grandpa. That's golden! @Old Kitty, somehow I am certain you two would have been soul mates! @Andrew, you're right...being kind costs nothing! I don't get why people want to be mean. @Charles, yep. Somebody has to love the animals! @Pat, perfectly explained...people prop themselves up...love it! I shall be repeating that! @Jen, she did enjoy her cups of tea. I still drink tea, just like I did with her! @Maurice, yep. That is a good way to see who is trustworthy! @Bish, I have found some of the most awesome people in the writing community...must be the open, creative mind thing going on! @Johanna, I couldn't agree more! @Cherie, me too...I've got the crazy bit down...now I just need a few more cats! @Lexa, there is something very peaceful about the country. I live in a rural area and I have come to love it. @Al, you're as wise as she ever was. @Birgit, that gave me a for real LOL. When I do that, my kids stare at me...guess they had to be there! And yes, Alex is kind to all. I noticed that very early on and heard my grandma in my head say, "He's good people." @Robyn, why thanks! Love to you too! @Julie, with your animal rescue efforts, Grandma would have given you the double thumb's up! @Sherry, she was a kind soul...for sure! @Mary, thanks! Your daughter must have a special heart. @Nutshell, nice to know you too! @Mary, I think you'd liked her. She was a wise woman! @Cathrina, thanks. Tag lines usually make me sweat...glad you liked it! @faraway, I've got the crazy thing down pat too. Life's too short to be totally normal! @Desert Rocks, I do love indies. And I've met a few bigs who are sweet, but boy those indies...they take it to a whole different level!! Alex...how do you do it?! It was great to hear from Elizabeth. I can picture her grandmother's pet farm. :) How wonderful that she had the space to help all of those animals. I want to see Frozen! I have heard great things about it. My sister is a bit of a crazy dog lady, but she has a farm so it works out. Dogs are all well behaved and taken care of. You gave me way too many links to follow today. Really enjoyed Elizabeth's post. Her grandmother sounds wonderful. Off to read your interview on Livia's blog, and check out the revision tips. I'll soak up any wisdom I can get! Elizabeth, what a great story about your grandmother. Her words of wisdom are spot on! Generosity of spirit comes from a good heart that's willing to help just because and not for any personal benefit perceived. Terry Lynn, I'm not a big YA reader but I do like the story you have with this one! Alex, I love that pic of Indiana Jones. I'll have to bookmark that video. I loved your article for the IWSG website. It's perfect! And timely. Thanks for all the news Alex. Elizabeth and her Grandmother sound wonderful -- wise and kind always is the best way to go. Thanks, Alex, for the Indiana Jones link; Raiders of the Lost Ark is my favorite all-time movie! Elizabeth, you astound me! I learn something new from you every time you blog. Thanks for this. And thanks for having her, Alex! Elizabeth, that is so so true. An incredibly wise quote from a wise woman :) Thanks for sharing! Happy Thanksgiving to you and Mrs. C, and stay thirsty, my friend. Happy Thanksgiving everyone and to you to Alex. Will certainly sign up for Mark's Xmas Cheer Fest. Lovely idea! This post was great, packed full of lots of stuff. Roland, sorry you have to work, but what you do is something that doesn't pause for holidays. Lynda, thanks - I really tried hard with that post. David, it's supposed to be amazing. I'm sure she'll enjoy it. Donna! Good to hear from you. Mark, you didn't want to miss Al's post. It's amazing. I was absolutely floored by how kind and helpful other writers were when I was that newbie who didn't even know what a query was. Though I'm still in the trenches of the unpublished, Elizabeth Seckman's thoughts are so true. There is nothing more profoundly satisfying than helping another writer find the joy of creating stories and sharing them with the world. Have fun outlining your new story, and Happy Thanksgiving! Such a great post! Really enjoyed Elizabeth's guest spot. I'm signed up for Milo's, and Julie's and Lexa's giveaways/blog hops. The end of the year is going to fly by! Hope you and your family have a great Thanksgiving, Alex! Yeah, my head is spinning...but in a good way. Going to focus on the guest spots. Loved Elizabeth's advice! Heading to see what you've got to say, traveling man. Loved reading Elilzabeth's post about her cat-loving grandmother. I'll stop in at Livia's to see the interview. That Dragon Award is super. Have to download mine and put it up. Happy Thanksgiving. Here's to a wonderful Dec. Loved your interview over at Livias. Ah, Galaxy Quest quotes... hard to resist. Yes, I know some crazy cat ladies. I don't have any pets myself though, so I'm just a bit odd. Wise advice from the cat lady! Glad to hear you're enthused about the new project Alex! I'm looking forward getting the KS launched so I can return to writing! So much to absorb in this post, Alex. I especially loved the piece from Elizabeth. Your ninja abilities of ability of being in multiple places all at the same time is impressive Alex. Hope you & your family have a Happy Thanksgiving. Holy wow that Indy pic is incredible!! Always loved those movies. There was a self-professed cat lady at the temp job I had right before my car accident 10 years ago. In addition to the numerous cats in her house, she also had a tent set up in her backyard for any stray or feral cats to be safe from the elements and get some food. I know some cat ladies. They have big hearts. I love the quote from Elizabeth's grandmother. I love Terry's book trailer. I have mixed feelings about Frozen. It doesn't look bad, but I don't like how they changed a story almost entirely focused on female characters (without romantic entanglements, to boot) to one focused on a female heroine and a lot of males around her. You'd never see the reverse happen, that's for sure. Late again for this party. Still, better late than never. Yes, post overload and a lot to take in. Anybody with a cat, according to Penny the Jack Russell dog and modest internet superstar, is crazy, whether male or female. It was very nice of the dragon dude to think of so many fine folks. Wishing you a peaceful American Thanksgiving. 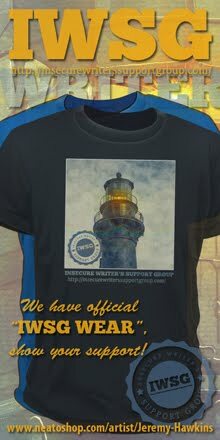 I have to remember that I joined IWSG. Yikes. Better make a note of it! I'm away for Thanksgiving and not online much. But I made it here! Have a happy Turkey Day! Whew! The ninja gathers more comments than cats have fleas! How wonderful!! @DMS, it was a fun place for a little girl to visit! @Susan, having the space is quite the blessing! @Helena, I have to agree! @Emily, hugs. Plain and simple. @Kristen, I am so glad I joined the writing community...go it alone and it is just so much harder!! @Madeline, Tina,Candilynn, and Lee- thanks! @Patsy, I've only got a few too, so maybe I just qualify as odd also! @Carrie-Anne, a tent? Wow. That's a cat lover! @Medeia, big hearts are good things. @Trisha, Trisha, you're definitely always in the good way! David, let me know when it launches. Carrie-Anne, crazy but nice of her to place shelter out for the strays. JE, I'm seeing it tonight, so I'll let you know. Gary, I didn't think Penny was fond of cats. Trisha, that's a wonderful idea. Elizabeth, you are most welcome! Elizabeth - sounds like your grandmother was a wonderfully caring person. Great advice, too! Alex - Happy Thanksgiving to you and your family! Holy posting, Batman!!! This is chock full of great stuff :) Alex, I'm so glad you're taking time out to write. Elizabeth, I love love love what your grandmother said about knowing a person's true nature. It's so true. Cool Ice Dogs trailer! Kudos to Milo for his promo, and Happy Thanksgiving to you and yours, Alex! A wise "crazy cat lady" indeed. I have a crazy cat uncle. He lives in a residential area and has 24 cats in his house, almost all were brought to him injured or homeless. They're his children. I like your writing tips. I do my out loud character reading in front of the dog. She doesn't seem to mind. Yes, very interesting interview, write the story you like to read, so I've often thought the same! @Susanne, she was a kind lady! @Rachel, stray kids need homes in the worst way...what a great lady your grandma is! I've been very lucky too, though to be honest, if I read some snark between the lines, I just cut and run. Life is too short for mean people. @LD, I understand your uncle's plight (though I am sure he gets a lot of joy from them). It's like people find out they have big hearts and just dump their unwanted animals on them. My poor grandma couldn't have turned a creature away if her life depended on it! Our family is looking forward to seeing Frozen and yes, we do know a Crazy Cat Lady! Rachel, for the most part, I've only met nice people in the writing community. LD, dogs don't judge, do they? Holy smokes! My trailer is on the hottest blog in the blogsphere. THANKS Alex! And good luck with your new project! Wow Alex! That's a ton of info! But good stuff! And I love Elizabeth's post. She's right on the money. We all need to be reminded. That motto about how people treat those who can do nothing for them is one of my life lessons, truly important. Looking forward to Godzilla. Elizabeth, Crazy cat ladies are my favorite people. Alex, it's absolutely alright to post Monday! I'd be honored for it to appear on the Ninja wall! Elizabeth, you are my hero. I'm copy/pasting this post and keeping it my files of "inspiration and crap" :) Love you to pieces, my dear. Cassie, that's almost as funny as how you spelled forty. I will make the rounds later! You are everywhere-I thought I spied you in a corner aisle, last week. I waved but you didn't see me, Ninjabread man! I loved your tips for revisions. They are good anytime, not just for NaNo. The tweet transcript is crazy but very interesting. I adore the video and images...As always, good stuff. Happy Thanksgiving Alex and thanks for wishing me Happy Birthday. Definitely plan to see Frozen over the holidays and Elizabeth's grandma gave her wonderful advice. Ignore the haters and riff raff. Hi Alex! Back from computer mayhem. Elizabeth, I suspect your grandma and I are related. I'm pretty sure I've heard my grandchildren refer to me as the crazy cat lady. The book sounds pretty wonderful. I'm looking forward to seeing Frozen. Darn it, Alex. I'm sorry I missed your hashtag chat. I feared I would, and two hours beforehand my family called and needed a ride. But it sounds like you had a good time with Bryan, which is lovely! It is hard to believe the Frozen movie I've seen commercials for is a classic. That's... so odd. Hope your Thanksgiving went well. I was late for Al's party as I have not been online from the past few days. It was a wonderful tribute to all of us. Hmm, a really interesting post, Elizabeth. You're grandma's a wise woman. I've heard Frozen was great---and can you believe I'd never even heard of the movie until yesterday?? You've got me psyched up about Godzilla next, Alex. Elizabeth grandma really loves her cats. How wise is she. We depend so much on our furry friends for companionship. I think if it weren't for my hubby I could possibly become a bit of a crazy cat lady. I had four cats at once at one point (two were rescues from bad situations...I couldn't help it! Ours is not a no-kill shelter). Elizabeth gives some great advice, and I think it applies to far more than just writing. Good luck for favorite blog! That is a great piece of advice, Elizabeth. I don't keep track on purpose, but I am aware of who helps others and who doesn't. It does influence whether I visit people or not. Whoa, that is an especially jam-packed blog post! Lots of awesome stuff going on. Alex, hope you had a great TG! Ella, I have missed you! Sheena-kay, you will enjoy Frozen. Joylene, I've missed you as well. Denise, you are still a winner in my book. Shannon, your husband is the voice of reason. Love your Grandmother- anyone who takes care of stray animals is a saint in my book! Cheers! Yay for amazingly giving crazy cat ladies like your grandmother! Where would be without them? Hope you had a great Thanksgiving, Alex! Thanks for the shout out -- 40 authors signed up so far, including Jay Lake, Cat Rambo, and Gini Koch. Should be fun this month. Yes, I too love chocolate! Great that you're featured on the Fussy Librarian. I'll have to check that out. Love Ice Dogs cover and the trailer is compelling. One of my sisters is a crazy cat lady. She brought her 5 cats with her to my parents' house making a grand total of 8 cats there. Can't wait to see your editing advice and glad to hear you are working on a new book. @Pk, I doubt you ever need to be reminded to be nice! @Sandra, they can be the most entertaining sort of people! @Sheena-kay, haters and riff raff...you always sum it up best! @Joylene, you must have lucky grandchildren!! @Denise, thanks and glad yo survived NaNo! @Spacerguy, I know I rely on my fury friends every day! @Shannon, My hubs keeps me in line too. I chased a stray down the highway the other day (never caught it) but my kids narked me out and my husband flipped out...we have enough animals!! @Misha, I don't mean to either, but it has become a life habit. I have known people I just love and will see them rip on someone who seems helpless and I just can't like that person any more. No matter how nice they are to me. @Alexia, I think cats are totally classy. @Kathe, she def couldn't turn away strays!